When you take a trip to the woods and you are very still and very observant, you may hear the crackling sound of twigs. Shortly after you may see a deer and her fawns moving with grace and agility and bounding off to safety. Now you can celebrate the beauty of deer with our deer check designs that you like the most. With a large selection of animal checks, our deer checks are one of our most popular personal checks. Whitetail deer are the most common large North American land mammal. They are one of the most popular animals to hunt in the world. With their muscular bodies, acute hearing and keen sense of smell, they truly are remarkable creatures. That's why we have a nice selection of deer checks for those that love hunting and those that love deer watching. 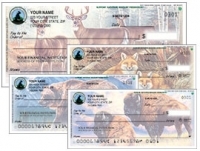 Whether you like their big antlers or their cute little white tails, you surely can find a personal check that will be fun to use every time you write out your checks. 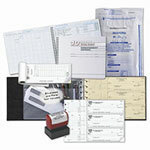 Order your checks today!